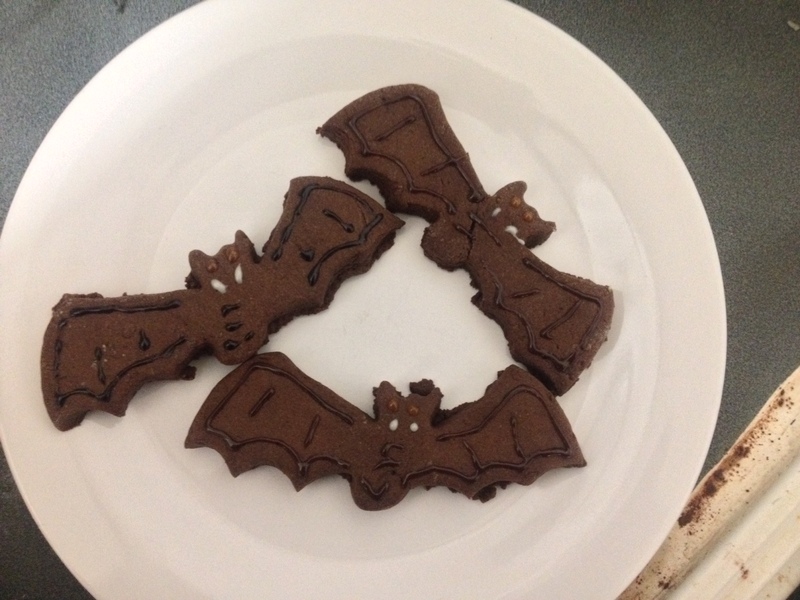 How sweet are these chocolate biscuit bats! They are also surprisingly delicious (they taste like the biscuit bit of bourbon cremes). Even better – they are really easy to make! The following recipe makes between 12-15 depending on how thick you want them. 1. Preheat the ole oven to around 180 C or the corresponding gas mark and line & grease a baking tray. 2. Mix together all of the dry ingredients. 3. Cut butter into small cubes, and rub in until the mixture is like breadcrumbs. 4. Add egg & vanilla and mix until dough-like. I’d recommend using your hands for this! 5. On a floured surface, roll out the dough. If you want “cakey” biscuits, roll to about 1cm thick. If you prefer crunchy biscuits, roll to 0.5cm. 6. Using your cutter, cut out your bats & place on the baking tray. 7. Bake in the centre of oven for 8-10 minutes. 8. Remove and allow to cool on a wire rack – then enjoy decorating them! I am sad to say that I had a little dough left over, and I made some nasty tricks to give out instead of treats. It was easy – just roll the dough into a sausage, then curl it around. I can’t believe I’ve just typed that. Surprisingly, these went down very well with everyone who saw them. I was amazed by the amount of people who wanted to eat a Dogpoo Biccy instead of a bat one. What a bunch of mingers! ← Weekend roundup – or how the Great British Storm didn’t hit Manchester.